Axialis IconWorkshop 6.10 0 out of 5 based on 0 ratings. What's New in Version 6.10? Compatible with Windows Vista" - Many Windows Vista" compatibility issues have been fixed in this version. New Interface for Windows Vista" - The application automatically detects Windows Vista" and propose a new user interface compatible with the new Aero" visuals. Make program files containing Windows Vista" compressed icon - Microsoft Visual Studio versions 6 to .NET 2005 do not support creation of executables with PNG-Compressed 256x256 icons for Windows Vista". Axialis IconWorkshop permits to compress icons directly in EXE/DLL files and use Windows Vista" icons in your software projects. Create icons the professional way using ready-to-use Photoshop templates - 10 ready-to-use Adobe Photoshop® Templates are provided with Axialis IconWorkshop". Load templates in Photoshop® directly from IconWorkshop", draw your icons in several formats and transfer the whole work in IconWorkshop. Your icon is created in one step. You can even create your own template using an easy to use XML description file. Support for 512x512 Macintosh icons for OSX 10.5 Leopard - Create extra large 512x512 icons for the new MacOS 10.5. Axialis IconWorkshop now fully support this size. New Object Pack #2 for Icons (Realistic Buttons) - This pack is composed of 500 hi-res image objects which have been designed to create icons in the style of Windows Vista". Using this pack you can easily create beautiful sets of buttons to be used in your projects (websites, application GUI, toolbars, dialog boxes...). With 156 symbols included and many shape effects (circle, rounded square, octagon, triangle) you can create a large variety of icons. The full set of objects is available for download on our web site to registered customers only. New Object Pack #3 for Icons (Quick Toolbars) - A collection of 256 image objects which permits to quickly create program toolbars. Using drag & drop, you can create in seconds icons and buttons for your toolbars by associating basic objects and overlays symbols. The objects do not contain details and have thick borders to allow the creation of small icons suitable for toolbars (32x32, 24x24, 16x16). The objects, which are provided in 256x256 format with alpha channel, permit to easily create icons containing various sizes for Windows XP®, Windows Vista" & MacOS®. The full set of objects is available for download on our web site to registered customers only. New Object Pack #4 for Icons (Web 2.0 Icons) - This pack is composed of 601 image objects which permits to quickly create icons in the style of Web 2.0. Using drag & drop, you can create in seconds icons and buttons for your websites and applications by associating background shapes, glossy effects, shadows and various ready-to-use texts and symbols. The icons can also be saved as optimized GIF, JPEG or PNG images for inclusion in your websites. To permit you to work faster, more than 500 ready-to-use derived symbols and texts have been added to the pack, including effects like outer light glow, soft shadow, emboss and 15° rotation. The full set of objects is available for download on our web site to registered customers only. Support for compressed Windows Vista" icons - IconWorkshop now loads, creates, edits, saves Windows Vista" icons. Windows Vista" includes a new PNG compressed icon format. It permits to create icons up to 256x256 with alpha channel with smaller file size. Axialis IconWorkshop now fully supports this new format in all features: edition, automatic format creation, batch creation, batch conversion, format normalization... Don't wait and create today your icons for Windows Vista". Object Pack for Icons (Glossy Buttons) - The first Axialis Object Pack for icons is included in IconWorkshop. It is a library of 150 image objects which will permit you to create an unlimited number of icons with various glossy effects and shapes simply using drag & drop. The images come in 256x256 high-quality PNG format. It permits to create icons containing various sizes up to 256x256 for Windows XP®, Vista® and MacOS®. Illustrator® to IconWorkshop transfer plug-in - Now you can import vector images with transparency directly from Illustrator into IconWorkshop through memory. You don't need to create a temporary file anymore. Full tutorial on how to use Image Objects - Creating icons from image objects is easy and produce hi-quality results. This tutorial will learn you how to create attractive icons in minutes using Image Objects. Background floating selection - Using this command you can easily place a floating object in background of your icon. This is useful to add a shadow or a colored halo around an icon. Copy/Paste Alpha Channels as Masks - Now you can use a grayscale mask image to apply it as Alpha Channel to an icon. Also, you can extract an alpha channel from an icon to create a grayscale mask image. 256x256 and floating Preview Window - The preview window is now adjustable (256x256 or 128x128). It can also be set as a floating window (easier to move in 256x256 mode). Full Macintosh® icon support - Now you can create icons for the Macintosh®. You're able to make, read, convert icons and save them as ICNS, RSC and BIN (MacBinary). All icon formats are supported up to OSX 10.4 Tiger. The new 256x256 image format is also supported. This is not an export-to-mac feature but a full implementation of the Macintosh® icon format specification in all features of the product. Batch conversion of icons from Windows® to Macintosh® - A very handy feature which will permit you to convert hundreds of Windows icons to Macintosh in minutes. Batch creation of Macintosh® icons from images - Select several images and create associated Macintosh icons, with all formats embedded, in a few seconds. Icon normalization - This feature permits you to create a set of icons with identical image formats embedded. This is very useful especially if you want to publish icons. Macintosh Icontainer® libraries support - This version permits to extract icons from Macintosh Icontainer® icon libraries. Multi-state Mac icons are also supported. Composition of icons using drag & drop - You'll create original icons from a library of symbols in minutes: Select the objects (disk, folder, screen...) in the librarian and drag them using the mouse in the icon editor window. Resize and move it using the mouse then repeat the operation to add other overlay symbols in your icon. You've done your own icon in seconds! Real time preview in Brightness, Hue, Saturation dialogs - A very handy feature which permits you to adjust icons with precision. Full support of JPEG 2000 - This is the future format for raster icons. It has a better compression ration than PNG (can be set with lossy compression like JPEG) and support alpha channels. It has been completely included in all features of the product (load/save/export/convert). 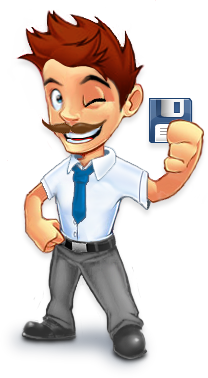 Full support of GIF - CompuServe GIF image format is widely used in Web pages because the majority of Web browsers recognize it. It has been completely included in all features of the product (load/save/export/convert) with Web-optimization options. Better image quality in image resizing and blending - Now crystal clear results in all scale/blending operations! Enhanced Editor - The Icon Editor has been greatly enhanced. It supports 32 bits XP icons with alpha channel, smooth drawing, many image adjustments (brightness, contrast, hue, saturation, flip, scale, rotation at any angle, drop shadow, filters), import/export (Photoshop PSD with layers, transparent BMP and PNG), Smart new image format creation, new color management (RGB/HSL models, compatible with Adobe® and Jasc® palette files). Professional Integrated Environment - The whole environment has been redesigned. Now it includes a built-in explorer with thumbnail preview which permits you to browse/search and display/import icon files from your disk drives. An Internet multi-source search engine lets you find icons and images on the Web. A built-in image viewer permits to open various image formats (Photoshop PSD with layers, 32 Bpp transparent BMP, transparent PNG, GIF, WMF, JPEG and more) and create a new multi-formats icon based on a portion of this image in just one click! A Compiler - Using this compiler, you'll be able to create redistribuable packages of your icon libraries. It generates a compressed user-friendly install procedure. The final package is 3 times smaller than the original ICL file. At least, with the Corporate Edition, you can force the end-user to enter a Serial Code to unlock the installation. A serial code generator is provided.